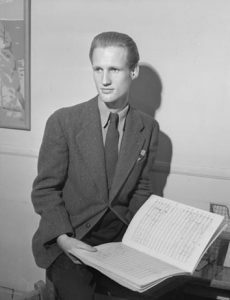 Born in Toronto in 1925, Harry Somers is considered by many one of the most influential and innovative Canadian composers of the past century. He was a founding member of the Canadian League of Composers (CLC) and in 1971 was named a Companion of the Order of Canada. Somers charming demeanour, rather dashing good-looks, and genuine talent earned him the unofficial title of “Darling of Canadian Composition”. … composition evolves from a body of tradition and a series of conventions, be they old or new. Now in the 1950s I was out of touch with developments that were happening in composition; I had to learn my own way. And my own way was to write works that employed Baroque techniques fused with serialism and the more highly tensioned elements of 20th century music I was familiar with at the time. Somers received honorary doctorates from the University of Ottawa (1975), the University of Toronto (1976) and York University (1977). From the late 1950s he composed almost exclusively on commissions from a wide variety of North American musical organizations and individuals. Harry Somers died March 9, 1999. He left Canada, and the world of music, an inestimable legacy of some of the most original and dramatically powerful scores of the century. His work has embodied Canadian music for the last half century and is a major part of Canada’s artistic heritage. Harry Somers’ 11 Miniatures for Oboe was commissioned by Soundstreams in 1994 and premiered by Soundstreams Artistic Director, Lawrence Cherney, on oboe. Learn more about this work and other Soundstreams commissions on SoundMakers.